In the photo he was 6 weeks old. He will one day hopefully be helping other dogs overcome problems they have developed. Hey there, Alex. It is good to hear from you and to see that wonderful picture of your German Shepherd puppy Murphy. Thanks so much for taking the time to come here and tell us all about your German Shepherd puppy today. 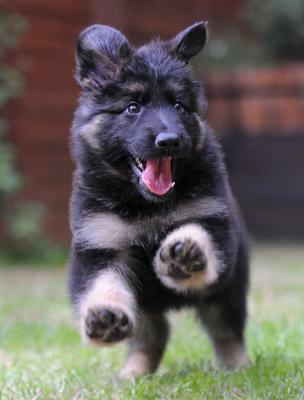 And I absolutely love the picture - that is without one of the cutest German Shepherd puppies that I have ever seen! You can just feel his joy of life. Thanks for sharing.